The HMG 4000 Hand–held Measuring Unit is a portable measuring and data logging device. It was mainly developed for all values measured in relation to hydraulic systems, such as pressure, temperature, flow rate and position. Moreover, it provides a very high flexibility, even when it comes to evaluating other measuring values. The main applications are servicing, maintenance or test rigs. The HMG 4000 has a very easy-to-operate user interface due to its large 5.7″ touchscreen. The operator can access all of the unit’s functions and settings by means of clearly presented selection menus. The HMG 4000 can record the signals of up to 38 sensors at once. For this purpose, HYDAC offers special sensors, which are automatically detected by the HMG 4000 and whose parameters such as measurement values, measuring ranges and measuring units can be set. On the one hand, there are the HYDAC HSI-Sensors (HYDAC Sensor Interface) for the measurement of pressure, temperature and flow rate, for the connection of which there are 8 analogue input channels. Furthermore, there is the option of connecting HYDAC SMART sensors to these inputs. SMART sensors can display several different measured variables at a time. Up to 28 special HYDAC HCSI-Sensors (HYDAC CAN Sensor Interface) can be connected additionally via the CANbus port, also supporting automatic sensor detection. HMG 4000 can optionally be connected to an existing CAN network. This enables the recording of measured data transmitted via CAN bus (e.g. motor speed, motor pressure) in combination with the measured data from the hydraulic system. The device also offers measurement inputs for standard sensors with current and voltage signals. The HMG 4000 rounds off the application, providing two additional digital inputs (e.g. for frequency or rpm measurements). The most impressing feature of the HMG 4000 is its ability to record the dynamic processes of a machine in the form of a measurement curve and render them as a graph — and, moreover, online and in real time. 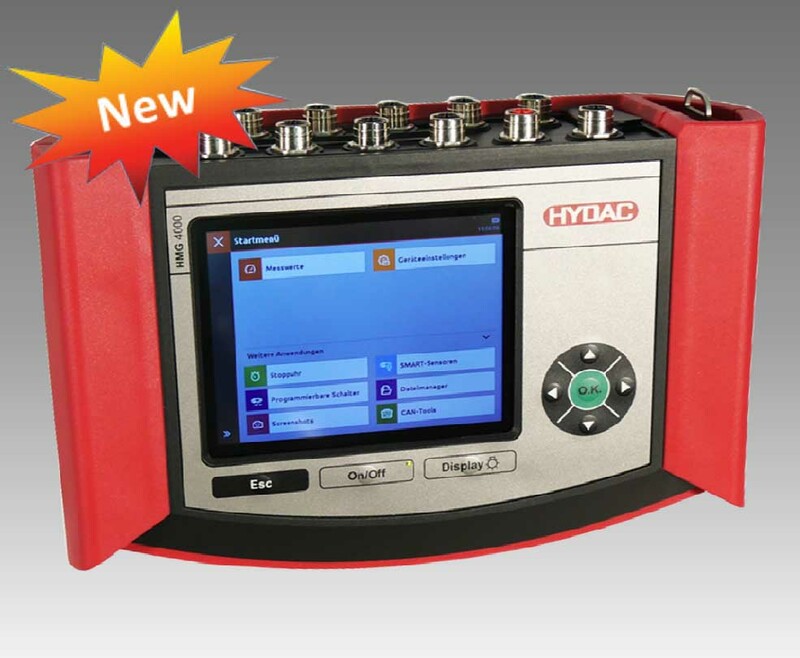 HYDAC software HMGWIN which is specific to the HMG 4000, is supplied for convenient postprocessing, rendering and evaluation of measurements on your computer. Capable of recording up to 38 sensors at once, 8 analogues, 2 digital sensors and 28 HSCI sensors via CAN bus. High-speed measuring rate, up to 8 sensors at 0.1 ms at a time. Convenient visualisation, archiving and data processing using the HMGWIN software.